ow that Samsung rumor store is closed, following the release of Samsung Galaxy Note 9, it’s time to head on to the next big buzz which is the upcoming Google Pixel devices. Following the Android Pie official release, Google is now preparing up for next major announcement – Google Pixel 3 and Pixel 3 XL. While there is no official word on the specs, who doesn’t like some early revelations and leaks. Only a few days back, we looked at images of supposedly Google Pixel 3 XL unboxing video which showcased a pair of Pixel buds-like USB-C headphones and a deep unconvincing notch. Now, a newly surfaced video shows all the speculated Google Pixel 3 XL specifications as well as shows off an enormous 6.7-inch display. 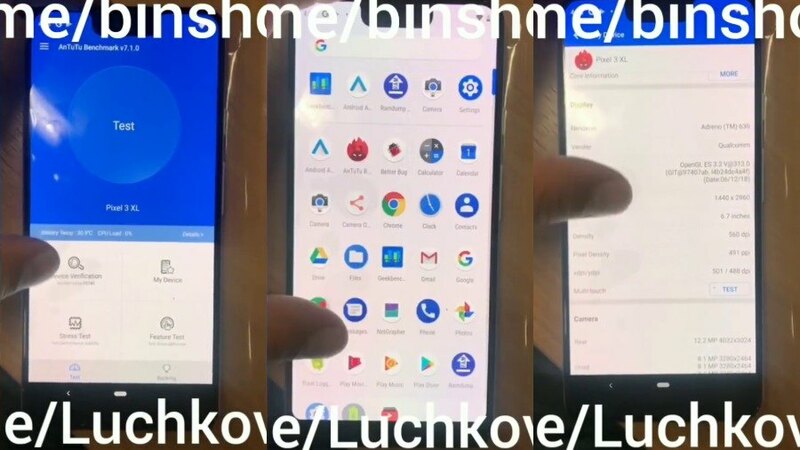 The Ukranian leaker, who came out with a previous leak as well, has now posted an entire Google Pixel 3 XL video. The clip showcases an Antutu application running on the device, consequently revealing the exact specs of the Google device. As per the test, Google Pixel 3 XL holds a monstrous 6.7-inch display with 1440 x 2960 screen resolution. Regarding the camera, the benchmark app lists out a 12.2 MP rear camera with three 8.1 MP front camera sensors. However, the demonstrated device, as well as previous leaks, indicate a dual front-facing camera. Confirming the previous rumors, Pixel 3 XL carries a Snapdragon 845 SOC with 4GB RAM. Although this device has 64 GB of Internal storage, Googe Pixel 3 XL is likely to come in 128 GB variant as well. Other leaked information includes a 3,430 mAh battery, Android 9 powered (Of course), and Adreno 630 GPU. The SIM tray is now at the bottom of the device, that’s new. Apart from that, again, we have no headphone jack, and the deep notch is still there. I guess we’d have to deal with it. If things go by the tradition, odds are Google will release Pixel 3 and Pixel 3 XL on 4th October. However, in the light of promising leaks, we might be looking at an early date.